Last night would quite easily qualify for one of the best nights in my entire life. Excluding the George Harrison tribute show I saw earlier this year, an Etype Jazz show I saw five years ago (both of which are a part of the Adelaide Fringe, so I don’t count them), and my annual trip to WOMADelaide, I saw my first rock concert; a Beatles tribute called The Beatle Boys, at Adelaide’s Thebarton Theatre! The Beatle Boys are an Australian Beatles tribute from Newcastle, NSW, and they are currently going around Australia and New Zealand, recreating The Beatles’ ’64 tour of Australia and New Zealand, as a part of the 50th anniversary celebrations. Unlike some of the other tribute bands I’ve heard of, they weren’t tacky (i.e. they didn’t wear fake-looking wigs; they actually had their hair cut in a moptop, or Arthur – as George called the infamous ‘do in A Hard Day’s Night!) and they weren’t deadly serious about the entire ‘We-have-to-be-exactly-like-The-Beatles’ thing. In fact, the show was a bit tongue-in-cheek; the guy who played Paul put on exaggerated facial expressions, and there was no shortage of jokey Beatles references! According to their website, they’ve been playing for 26 years, and have played everywhere from Swaziland to Canada. Two years ago, they did a ‘rooftop concert’ on top of the Museum of Contemporary Art in Sydney, which I just watched on YouTube, and is really cool (I then proceeded to watch Let It Be music clips, and then daydream about the future day it is released on DVD/BluRay; it was supposedly going to be released last year, but that clearly didn’t happen!)! 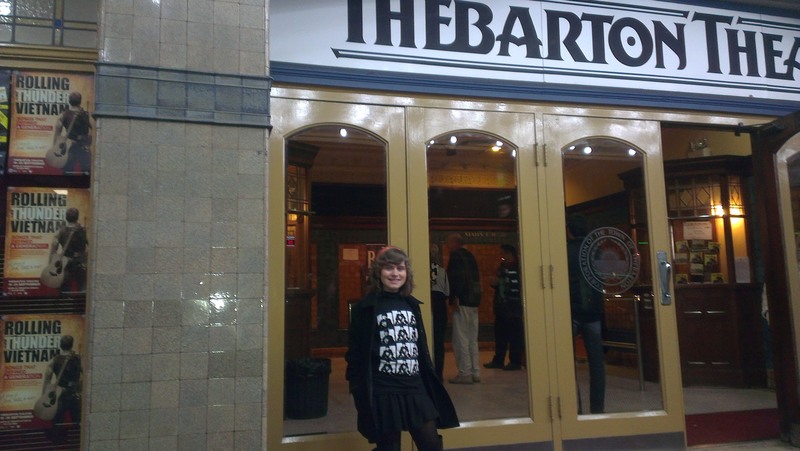 Last night, their gig consisted of two parts, separated by an interval; the first part was a recreation of The Beatles’ Melbourne concert, with the addition of ‘This Boy’ (which was only played here, in Adelaide). Before the band appeared on the stage, a collection of footage showing The Beatles arriving in different cities around the country, and songs recorded by John, Paul, George and Ringo/Jimmie’s support acts were shown/played on a screen. Finally (as excitement built up), the lights dimmed, the final support act’s song faded, and The Beatle Boys ran onstage. They did a great job with their version of The Beatles’ concerts from 50 years ago; in some aspects, it was an almost-exact replica of the footage I have seen (Scouse accents and all), and in others (as I said before) it was very tongue-in-cheek, and not-at-all serious. They encouraged us to scream (when they weren’t playing! 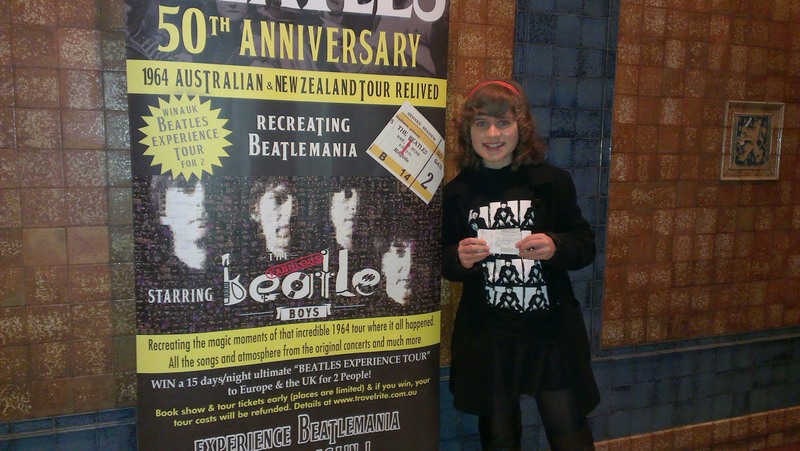 ), dance, clap, sing and generally be a Beatlemaniac – naturally, I did all of the above things! The second part consisted of “more than eleven songs,” as the man who played John joked, including material right from 1962 to 1969. They played everything from ‘Love Me Do’ to ‘Get Back’, ‘I Should Have Known Better’ to ‘Revolution’, and ‘Day Tripper’ to ‘Back In The USSR’. There were some very funny jokes in this part, including ‘Paul’ remarking, “The White Album is my favourite album, ’cause we could do whatever we wanted!” I did a lot of filming of both halves, so once I’ve downloaded them off Mum’s phone, I’ll pop them on here, so you can see the band yourself. It’s not quite the same as seeing them live (which – trust me – is quite an experience), but you’ll get an idea of how good they were! After the show, The Beatle Boys came out to the foyer, and the majority of audience lined up for photos and/or signatures. 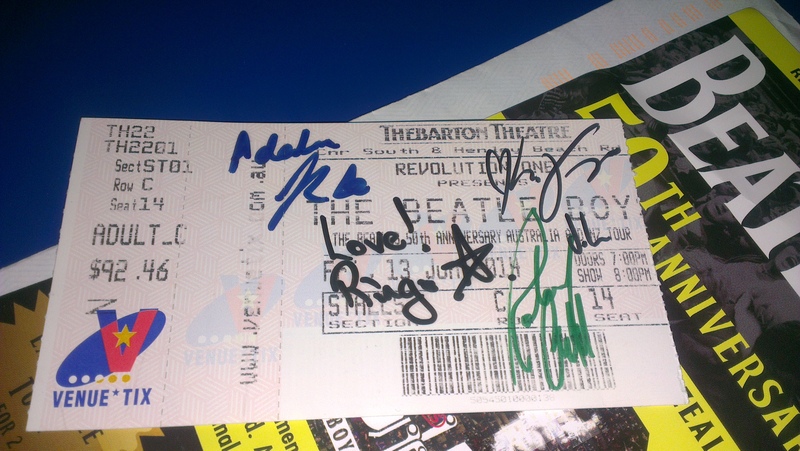 As you can see above, I got pictures with them all, and as you can see below, I got them to sign my ticket. 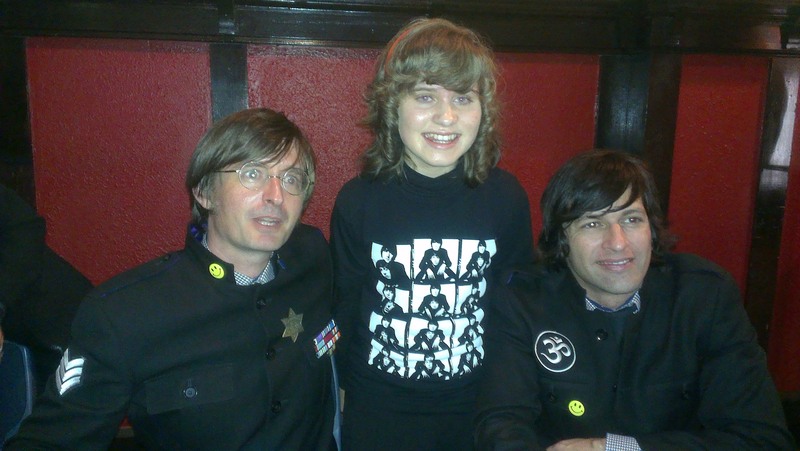 They were all really nice men, and they were quite impressed with my gorgeous John-and-Paul tee from last weekend! 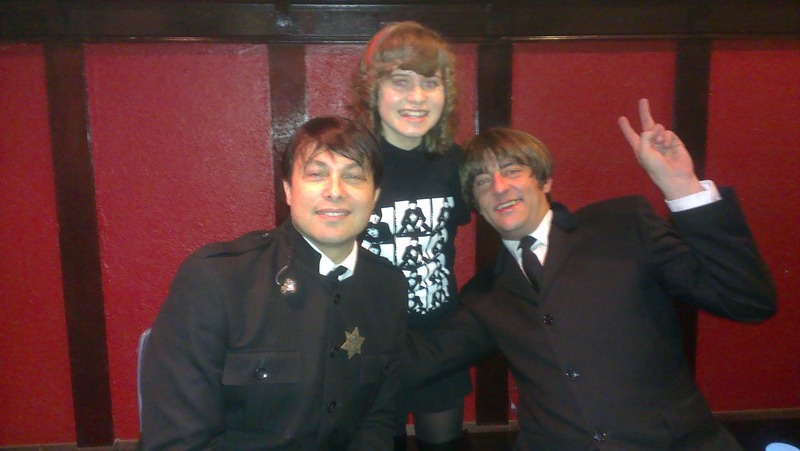 Just think – what a gorgeous job ‘Beatles impersonator’ would be. I can think of almost nothing better than playing John for a group of like-minded fans; sadly, though, this is impossible because I am a girl, so I’ll happily be content with my dream of being a musician when I leave school. I’ll just upload the rest of my pictures – after that, good day sunshine, until I upload the videos of the concert (tomorrow, maybe)!